For loft ladders, loft access hatches, loft boarding, loft storage solutions, lighting and Velux windows, look no further than Lofty Solution. 01. The Lofty Solution team is made up of professional time-served tradesmen. We have been providing quality loft storage solutions in the North East for over 12 years. 02. 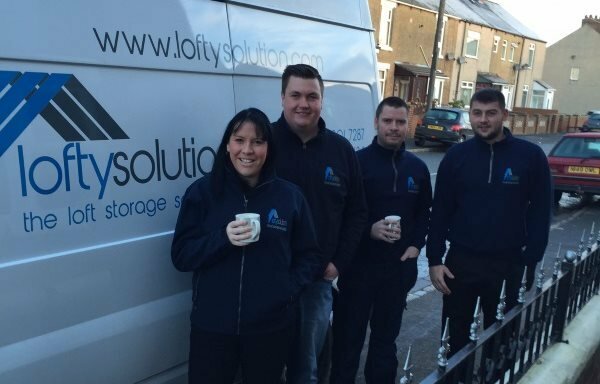 Lofty Solution is the North East's busiest and most popular loft storage solution specialist, with the vast majority of our work coming through recommendations. 03. We offer a professional, personalized service, and place great importance on quality materials and products to gain complete client satisfaction. 04. We guarantee minimal disruption during the work, allowing you to continue relaxing and enjoying the comfort of your home, while we transform your loft within one day. 05. We guarantee a neat and tidy service, providing dust sheets and always hoover up at the end of the job. 06. We are so confident of our workmanship and products, that we now offer a lifetime warranty on all our work!. 07. 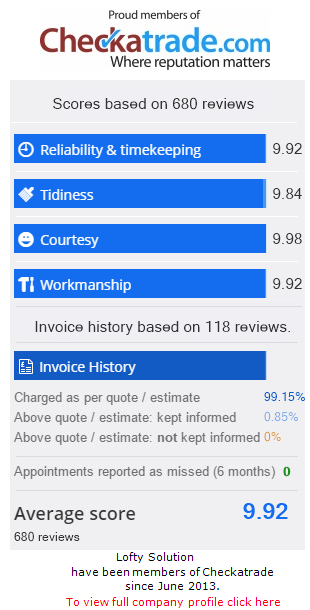 For added reassurance, evidence of previous works is available through our Checkatrade feedback. Loft boarded and new hatch created. Loft fully boarded and new loft hatch and ladders fitted. New loft hatch and loft flooring installed. Boarding 3/4 of loft and installed new hatch and ladder. Fitted a drop down hatch and loft ladder. Excellent workmanship for fitting loft ladder and moving attic access. Loft floored and ladder fitted. Loft boarding and ladder installed. Loft ladder and boarding out. Loft fully boarded out. Floor strengthened walls plastered lighting, sockets, loft hatch. Velux windows. Loft storage and access created with hatch and ladder. Insulated and boarded loft and lined roof with breathable insulation. New loft ladder. New loft ladder and hatch installed. Loft space made into storage space with hatch and ladder. Loft boarded and double socket added.